The Boilerhouse B90HE Regular Oil Boiler is a condensing floor standing unit that’s highly reliable and comes with a range of features and benefits. Designed and manufactured by Warmflow, this unit comes with an efficiency rating of 91.7% and a SEDBUK A rating. With an output rating of 26kW, this boiler is perfectly suited to smaller homes or properties with one bathroom that don’t have such a high demand for heating and hot water. Available in a wide from of other outputs right up to 33 kW, there will be a unit capable of meeting the demands of many different homes. 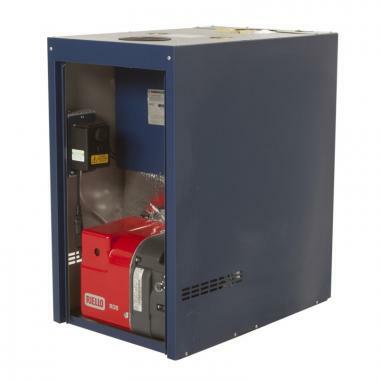 The unit comes in a blue leathergrain casing for maximum durability and is designed to be placed in a boiler house or garage. They come fitted with a highly efficient heat exchanger that can be easily accessed for servicing and the latest Riello burner technology making the boiler extremely quiet in operation. The boiler also features a condensate trap as standard, they’re fully factory wired and also boast a burner and thermostat that’s supplied as standard. With flow and return connections at the top, installation is made much easier and that will save you time and money. Compact in size and robust in nature, this unit is suitable for use with conventional flues or with the multi optional HE ‘Easy Fit’ Balanced Flue System. As a Regular boiler it heats your central heating system directly and also produces hot water for your cylinder. Due to the fact that you need a hot after cylinder, which is often fed by a cold water storage cistern located in the loft, this boiler type isn’t suitable for smaller homes or properties where space is limited. Featuring a 7 year warranty, you’ll peace of mind long after installation.